Include package of Four AA batteries for $1.25? Stands 4" tall, with large talk button right on top. Features large side speakers for ease of hearing, and clear computerized voice. Volume control can be set to Quiet, Regular or Loud. All other controls are on the bottom of the clock where they won't be bumped. Boasts rubber feet so it won't slide around. Turn clock over for digital time display. Measures about 5-3/4 in by 4-1/2 in by 3 in. Package Weight: about 9.2 ounces. Some folks are looking for an easy-to-use clock, a unit with just one exposed button so no one will accidentally bump something and change the time. Others need a clock that's nice and loud, to be heard over a crowded room or noisy television. Finally, some of us just want a clock that's different - perhaps one with a unique shape. Well, come one, come all ... this clock has all that and more. 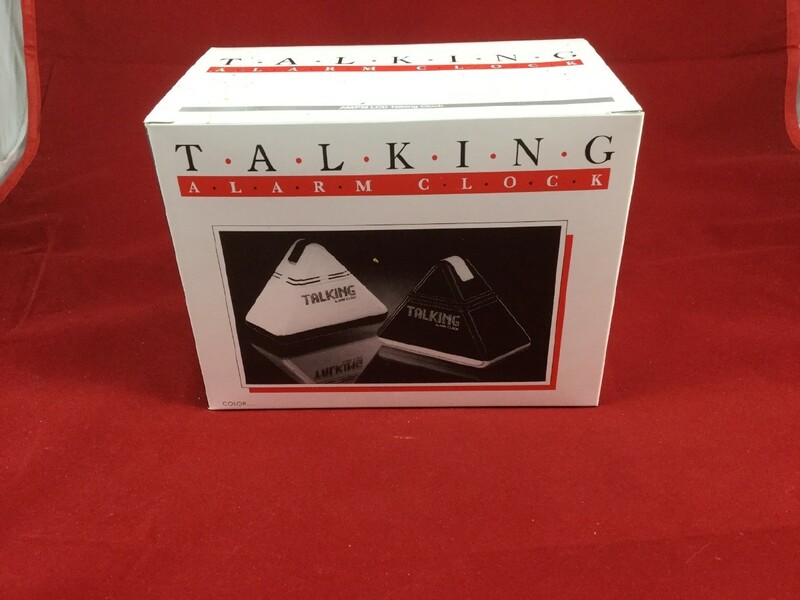 Your new talking pyramid stands a little over 4 inches tall, so it's easy to find and tap, even in those first groggy seconds when we first wake up. The large side speakers make the spoken time easy to hear from all directions, and the rubber feet keep the clock from sliding around. The large talk button is right on top, so all you have to do is tap the top to hear the time. All the other controls are found on the bottom of the clock, so no one will bump or change anything by mistake. Just flip this elegant clock over, and you'll find the Alarm on-off switch, the small Hour and Minute buttons for setting the time, a Mode switch, and a volume control. Yes, that's right - this clock has three volume settings - quiet for at night, regular for during the day ... and loud for a crowded room. The loud setting is also great for hard-of-hearing folks. 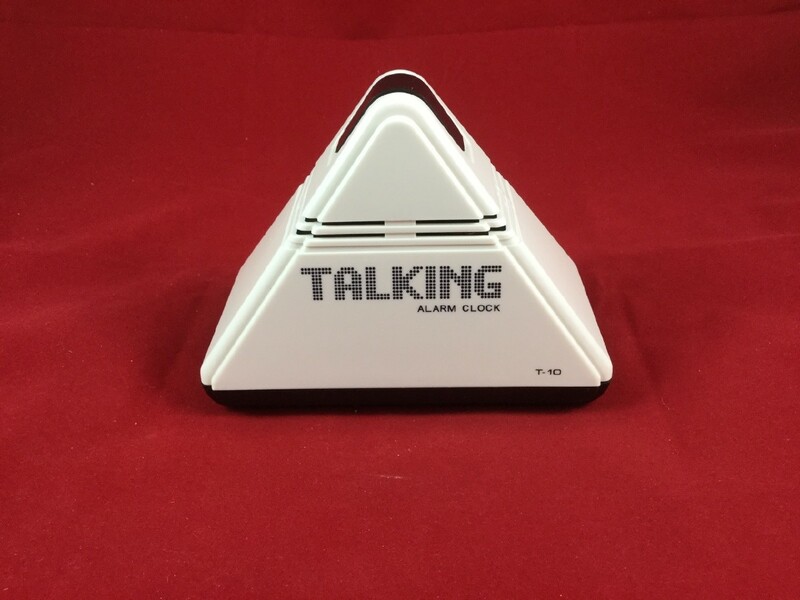 The alarm lets you choose between three popular alarm sounds (rooster, beep or cuckoo) and has an optional snooze feature. Note that you do have to turn this clock over to see the digital time display. Uses 4 AA batteries, which are not included. Directions for the Pyramid Talking Clock From Future Aids, The Braille Superstore. Turn the clock over so the back is facing up. Lift the plastic battery cover on the right side, and insert 4 AA batteries into the battery compartment. The switch furthest from you is Alarm. To the left is off, and to the right is on. The 2 buttons below this switch are used to set the time. On the left is Hour, and on the right is Minute. Below these buttons is the Mode switch. To the left is Set Alarm. To the right is Set Time. In the middle is Normal. The switch closest to you controls the volume. Left is high, middle is normal, and right is quiet. To set the time, move the Mode switch to the far right. Press the Hour and Minute buttons until the correct time is reached. Move the Mode switch back to the middle position.